It's time for another fruity slot! NetEnt brings you yet another classic fruit-themed slot to add to your collection, here at Easy Slots. Berry Burst is a traditional fruit-themed slot bursting with colour and juicy features. The design is very simple, yet very colourful, with very realistic looking juicy fruits. The fruits are so lifelike that they look good enough to eat! Of course, like with any fruit slot, there's a cheesy and upbeat soundtrack to go along with it. The aim of this game is simple; to match at least 5 identical symbols across a payline. Other exciting features include wilds and Berry Burst cluster pays. Are you ready for another classic fruity slot? Berry Burst is just like any other traditional fruit machine slot. Berry Burst is a 5 reel, cluster pays slot bursting with fruity goodness. Behind the reels, you'll see a rainbow coloured background which looks like a cocktail of fruits mixed together to create a delicious fruit punch. Upbeat fun music can be heard in the background as you play giving the game a more modern feel. The fruit symbols look very real - it's almost tempting to grab a piece of the tasty fruit through the screen! Symbols include tangy orange segments, juicy limes, and a variety of succulent berries. You'll also find shiny spades, diamonds, hearts, and clubs wrapped around tiny bubbles. Fruit and Card Symbols - The lowest paying symbols are the diamonds, spades and hearts and these award up to 1000 times your total stake for a full screen. Up next are the limes and grapes and these grant up to 2500 times your total stake for a winning combination. The oranges slices are worth slightly more at 3000 times your total stake. The highest paying symbols are the raspberries and these can award you with a multiplier of up to 5000x for a full screen. Expanding Wilds - Wild symbols can pop up anywhere on the reels. Landing one or more wild symbols will instantly expand to fill the whole reel. One the reel has been filled, you'll be given another re-spin. It is possible to fill the entire reel with wilds to gain a great multiplier prize of 500x. The prize is even better if played during the re-spin feature as you can win up to 1000 times your total stake. Cluster Pays - If you connect 5 or more of the same symbol either horizontally or vertically, then this opens cluster pays. Symbols on either side of the cluster will be replaced when landing 6 or more wilds. 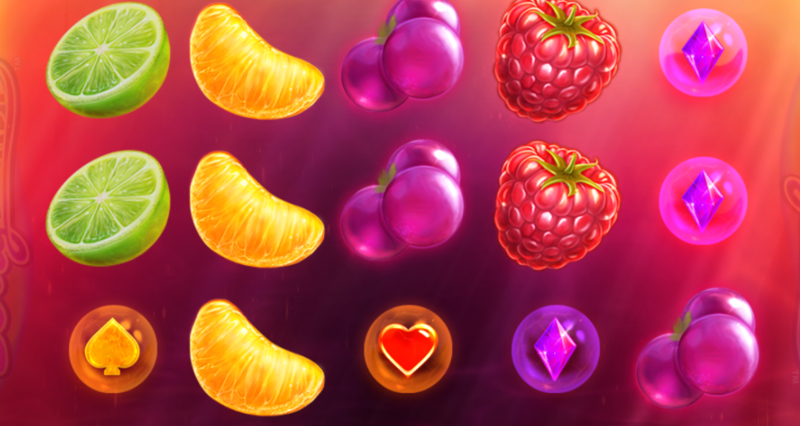 If you enjoy fruit machine slots, then you will love Berry Burst. Everything from the design, to the upbeat music, and fruity features are all delicious. If you want a big win, make sure to look out for the berries as they can award a tasty prize of up to 5000 times your total stake. Or try our other uk bonus slots here at Easy.